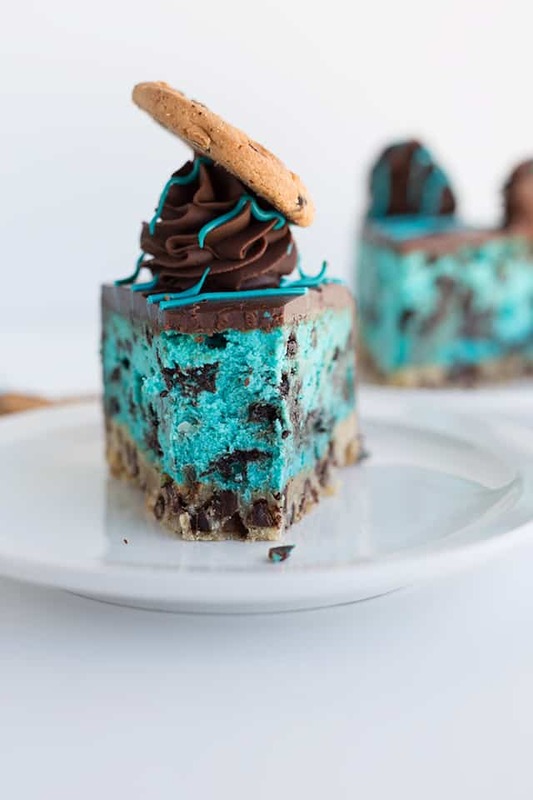 Kids will go crazy for this cookie monster cheesecake! 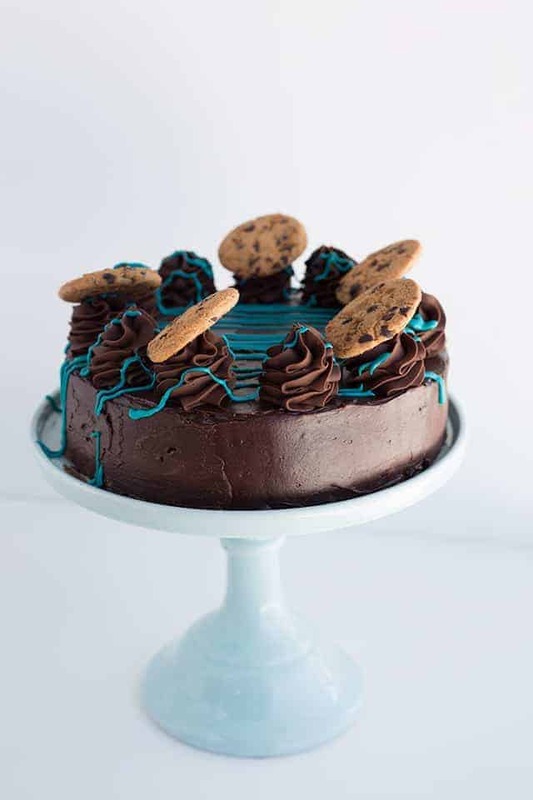 There’s a chocolate chip shortbread crust with a creamy cookies and cream cheesecake on top. It’s frosted with a semisweet chocolate ganache that’s been allowed to thicken and a fun blue candy drizzle! I wish I could say that I came up with this recipe, but I made it out of my friend Dini’s cookbook, Secret-Layer Cakes. This book is just full of fun and flavorful recipes. If I were to dog ear all the recipes that I wanted to make, pretty much all of the pages would be folded over. I don’t feel like the title of the book does its awesomeness justice. Side note: I don’t actually dog ear any pages of my books. I like my pages crisp and slightly stained because I am an incredibly messy baker. I have officially fallen in love with using chocolate ganache for frosting. It was incredibly easy to spread and it still looked good even if it was 100% smooth. You might have noticed that I left mine slightly jagged in spots. Well, my perfectionist side took a break and left me to my own devices. The cheesecake and I both survived the day. Yayyyy! This cheesecake is slightly different than my go-to base recipe. It calls for cornstarch and no sour cream. It’s a nice switch from mine and reminds me to maybe think about adding different variations of my base recipe to the blog. Maybe in the distant future. 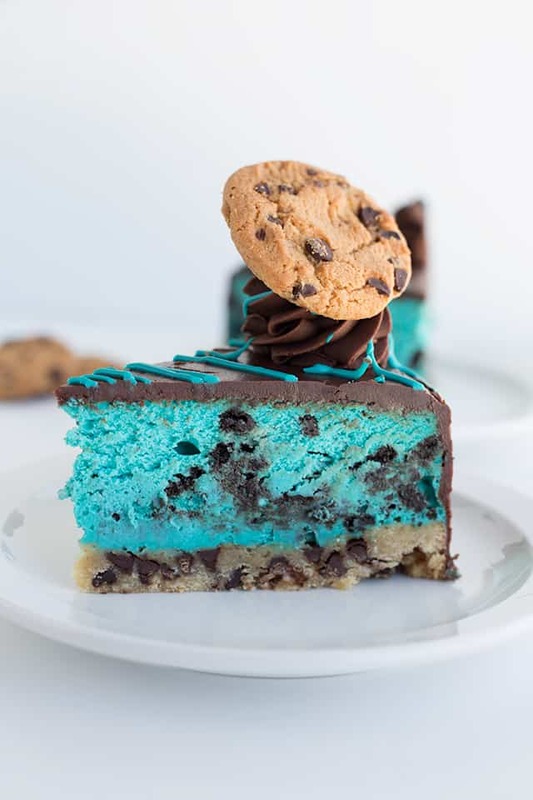 This cheesecake totally reminds me of some cookie monster ice cream that I saw floating around Facebook last summer. I loved that idea so much and I’m thrilled I got to make my own cookie monster recipe! My son loves this cheesecake. There were seriously so many options that I wanted to make that he had to pick one for me. 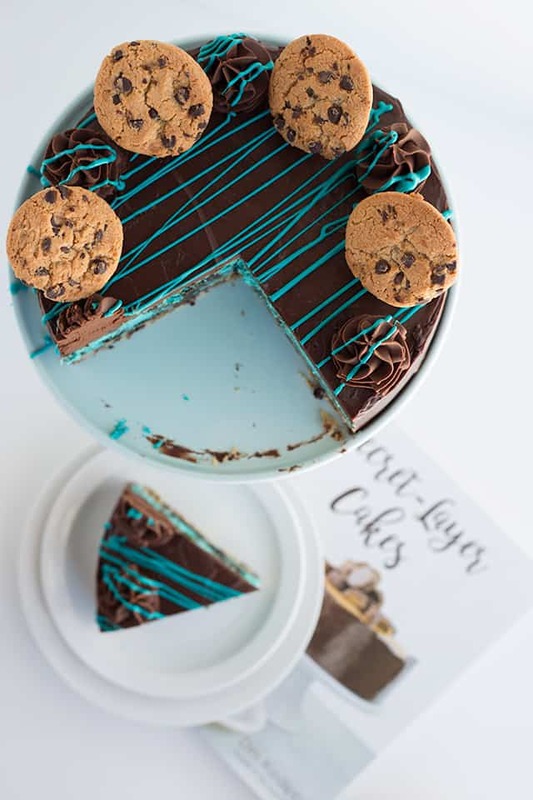 This cookie monster cheesecake caught his eye. I was leaning towards the buckeye brownie cheesecake that’s in the book honestly because my love for chocolate and peanut butter is extreme. You should see the picture for that buckeye cheesecake! I was totally sold on it just from the picture. Piles of peanut butter cups, a thick layer of peanut butter glaze, peanut butter cheesecake and a brownie butter with more peanut butter cups in it, folks. Want to see it for yourself? Grab the Secret-layer Cake cookbook on Amazon! 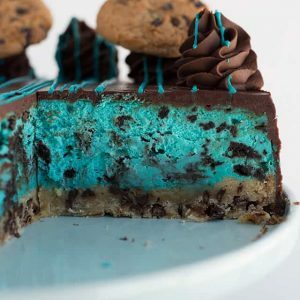 This cookie monster cheesecake has a chocolate chip shortbread cookie crust with a cookies and cream cheesecake filling! It's baked and then frosted with a semisweet chocolate ganache and topped with chocolate chip cookies! Kids love this! Chocolate Chip Cookie CrustPreheat oven to 350 degrees. Spray an 8-inch springform pan with nonstick cooking spray. In a microwave-safe bowl, add in the butter,, salt, and brown sugar. Microwave in 30-second intervals and stir until the butter is melted. Let cool until 10 - 15 minutes. Once the butter mixture has cooled, add the egg and vanilla extract. Whisk until incorporated. Add half of the flour into the butter mixture and stir until combined. Add the remaining flour and the mini chocolate chips into the batter and fold until the flour is worked and the chips are evenly distributed. Spread the batter into the prepared pan. Bake for 15 minutes and remove from the oven. Reduce the oven to 300 degrees and start on the cheesecake filling. Cookies and Cream CheesecakeIn a large mixing bowl, add the cream cheese, cornstarch, and granulated sugar. Beat with a hand mixer on medium until smooth and creamy. Add the salt, cream, vanilla, and a few drops of blue food coloring. Mix on medium until incorporated and smooth. Add more food coloring if needed to sort of match the cookie monster's color. Add the eggs one at a time and beat just until the egg is worked in. Scrape down the sides after each egg. Fold in the Oreo pieces. Pour the batter over the cookie crust. Spread it out evenly. Wrap the bottom of the springform pan with heavy duty tin foil. I like to do two layers of tin foil to keep the water out of the cheesecake. Place the cheesecake into a slightly bigger pan and fill with an inch to two inches of hot water. Place in the oven. Let the cheesecake bake for 1 hour 10 minutes until done. To make sure the cheesecake is done, give it a wiggle. If it slightly jiggles in JUST the middle like jello, then it's done. If it jiggles all over, it needs to bake longer. Turn off the heat and crack the oven door slightly. Let it cool in the oven for 30 minutes. Remove from the oven and the hot water bath and let cool to room temperature. This can take about 4 - 5 hours. Remove the sides of the springform pan. Cover and place in the fridge to chill overnight. GanacheIn a microwave-safe bowl, add chocolate chips, whipped cream, and salt. Microwave in 30-second intervals and stir after each one. Repeat until the ganache is smooth and completely melted. Let it sit at room temperature until it thickens to a spreadable consistency. You can speed up the process by placing it in the fridge. Keep an eye on it. Spread the ganache on the chilled cheesecake. Add the remaining ganache into a disposable piping bag fitted with a 1M tip. Pipe swirls on the top of the cheesecake. Add the candy melts to a microwave-safe bowl and microwave in 30-second intervals, stirring after each interval. Do this until the candy melts are melted. Add the candy melts into a sandwich bag and cut a small hole in one of the corners. Drizzle the candy on the top of the cheesecake. Top the swirls of ganache with the chocolate chip cookies. Beautiful cheesecake and this unique recipe definitely has me interested. 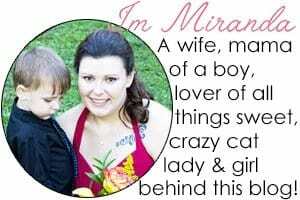 Im using this recipe for a gender reveal cake! It looks and tastes amazing. 10/10 would recommend.